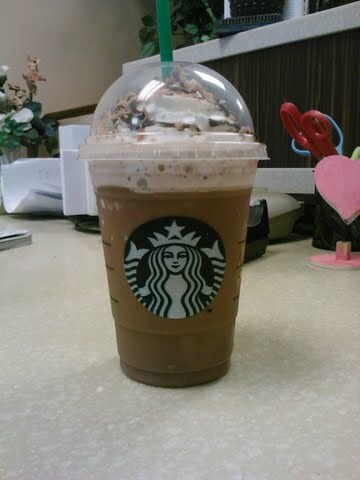 ﻿﻿﻿﻿﻿ Last week I went into Starbucks to try out their Mocha Coconut Frappuccino blended coffee drink. Now I'm no fan of coconut at all but I still went ahead and tried the drink anyway. I put in my order of the grande size and my barista blended up my frappuccino beverage and handed it to me once she was done. The frappuccino looks like a chocolate blended coffee drink with whip cream on top, chocolate syrup drizzle over the whip cream, and coconut shavings on top of the whip cream also. Once I took a sip, the Mocha Coconut Frappuccino had a chocolaty coconut taste to it that reminds me like I'm sitting on a tropical island, laying on the beach soaking in the sun with a yummy frappuccino in my hand. I'm not sure if it was the drink or maybe it was something I ate for lunch. But I'm still pleasantly surprise how good the drink is. Also I've never knew that Starbucks served this drink once before and it did so well that they brought the drink back for the summer. I'm going to give this drink another try and if my stomach gets upset again, then I'll know it's the drink and I'll order it with soy milk instead of regular milk. Is Starbucks Mocha Coconut Frappuccino Worth a Try? This is a good frappuccino considering that I don't like coconuts. I believe other people who don't like coconuts will also like this drink because the chocolate taste kinda over powers the flavor.